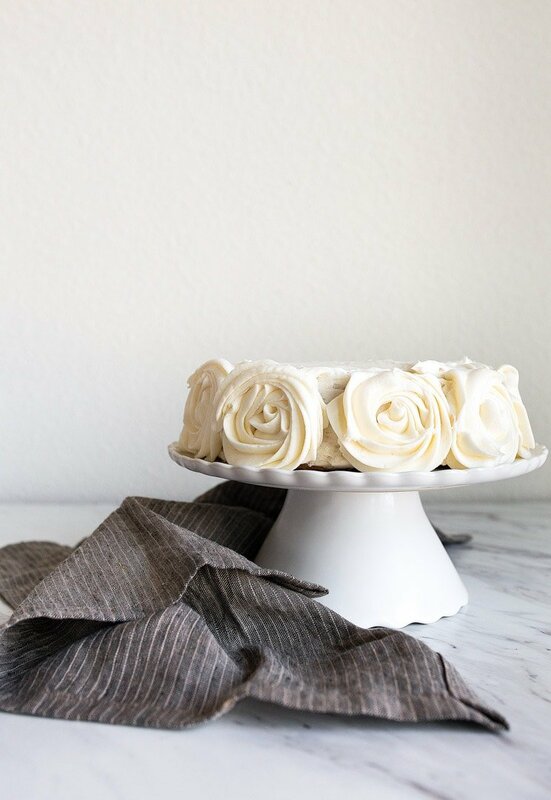 Mini vanilla cake for two for celebrating anniversaries, date night, or just for fun. 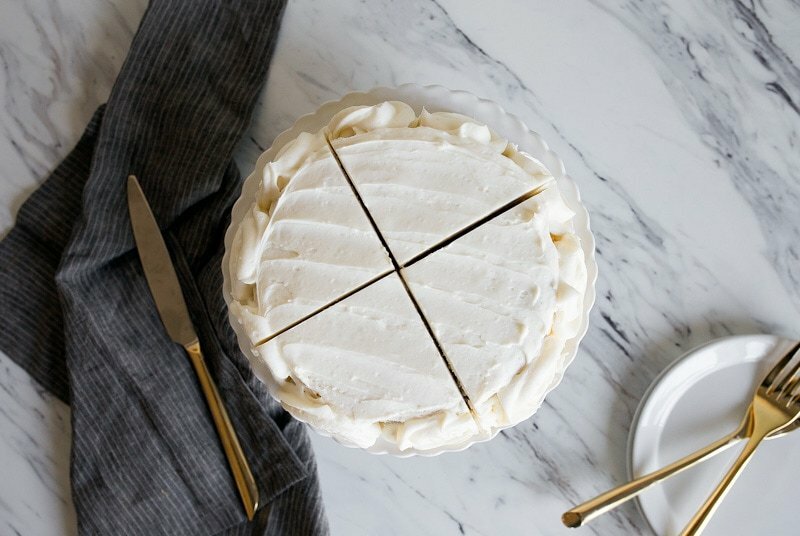 As a die hard vanilla lover, this cake is a love letter to myself. It’s not that I have anything against chocolate, but vanilla holds my heart. Incidentally, if you need a mini chocolate cake for two, I’ve already written you that love letter. To make a mini cake for two people, you will need a 6″ round cake pan. The one I like is here. You’re looking for a 6″ cake pan with 2″ high sides. I’ve tested 6″ cake pans with 3″ high sides, and I’ve found that the extra inch radiates more heat in the oven and the cakes can sink after baking. I find my 6″ round cake pans at Michael’s or Hobby Lobby in the cake decorating section. This cake makes 4 small slices of cake, which I love, because then I can eat two slices of cake in one day! It’s perfect for celebrating an anniversary (side note: have you seen my wedding cake cupcakes? ), or for having a fun date-night at home. This recipe comes from my latest cookbook, Sweet & Simple: Desserts for Two, and I decorated it with chamomile flowers in the book. Today, we did easy buttercream roses, which are so simple if you have the right tip. I use Sally’s piping tutorial for learning how to make these easy flowers, and now I hardly decorate a cake or cupcake without using her method! Sally makes me feel like a baking goddess. All you need is a Wilton 1M piping tip to make pretty circles around the outside edge of the cake. 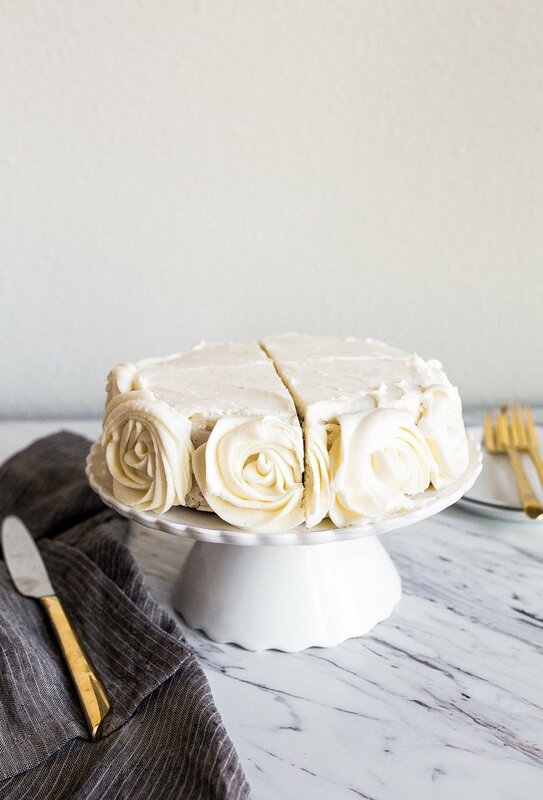 Since this is a mini vanilla cake for two, we only have room for one row of roses. However, next time you’re decorating a big cake, try making several lines of them. Buttercream roses look difficult, but they are so easy to do! Just cut the cake into 4 equal slices, and serve it! Recipe from: Sweet & Simple: Desserts for Two, my third cookbook baby full of EASY desserts that have less than 10 ingredients. 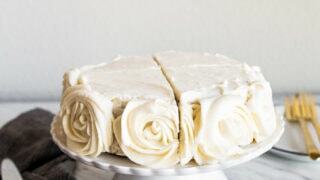 Mini vanilla cake for two people with vanilla buttercream roses. Preheat the oven to 350, and spray a 6" round cake pan with 2" sides with cooking spray. Line the bottom of the pan with a round of parchment paper. Use a little more than half of the buttercream to frost the cake. If you made the cake ahead of time and frozen it, it's best to apply a crumb coat of buttercream before applying a second layer. Place the remaining 1/4 of the buttercream in a piping bag fitted with a 1M tip, and pipe roses along the outside edge of the cake. To make a rose, pipe a spiral shape, starting inside of moving around the center. *Instead of whole milk and apple cider vinegar, you can use 6 tablespoons of buttermilk. The cake may be baked and frozen, tightly wrapped for up to 1 month. Defrost before frosting. such a pretty little cake!! love! Is there any chance you could hold off writing another dessert cookbook until I’m all caught up? You mentioned a ginger cake… I can’t find the recipe, can you help? YAY for vanilla! I was hoping your would make a vanilla version. Now I know what to make for my daughter’s 21st birthday. I have to mail it to her, so 6 inch is perfect. Thank you. That is one delicious and beautiful cake! I’ve got my pans, now I’d love to know where you get your gorgeous little cake stands. they had some really cute ones in the dollar spot at target a few weeks ago, I was surprised to find them there. I picked up a pretty blue glass one. as much as I am a die hard chocolate lovin’ gal, I’m on team vanilla cake. There’s just something extra lush about it. Can’t wait to try this recipe – I’m excited about that whole tablespoon of vanilla! Sooooooo in love with 6 inch cakes :-) :-) Thank you so much ! 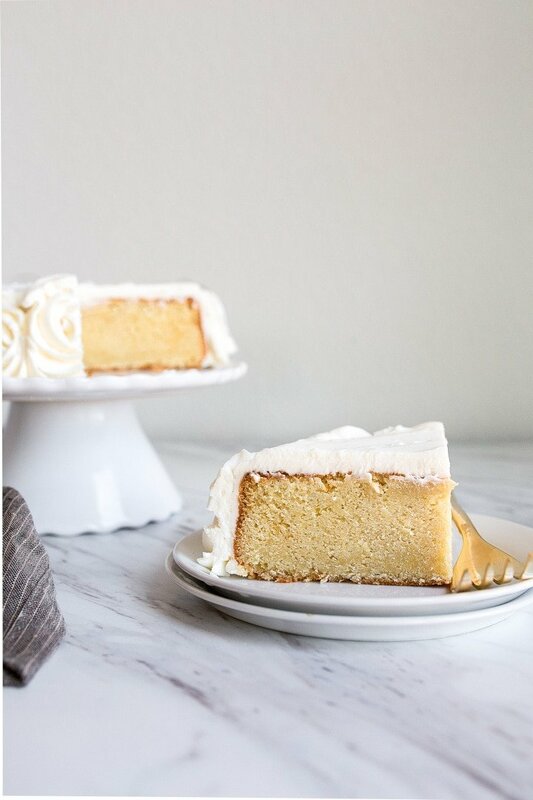 My husband loves vanilla cake- I think I just found the treat to make for our anniversary this weekend! Wow, what a wonderful cake. Vanilla is my favorite flavor and any cake or recipe of vanilla drives me crazy. This one is alluring and i am sure the taste would be mouth-watering. I love vanilla cakes and this one looks simply delicious and so fluffy. Can’t wait to try this recipe. These cakes are just perfect for 2 people & help with waistline. Oh and did I mention Delicious too? Thank you for these lovely recipes & I look forward to your next dessert cookbook. I think this mouthwatering cake is perfect for more than 2 people and I love the way decorated it. Great work. Just made this is baking right now, the cake batter was really tasty! Can’t wait to taste the baked cake, going to have strawberries and whipped cream in stead of frosting it, this time. This cake turned out so well, and is the perfect size! This was the first cake I’ve ever made that isn’t from a box and it was super easy! Thanks for this! This is amazing.. I just made it (the vanilla cake) and I love it!!!! Hi! How can I adjust this recipe for a 9” pan? I ended up doubling the recipe and it turned out great in a 9” if anyone was wondering! Delicious cake. Sara, I’m thinking of doubling too! Did you use a 9” circular pan? Thanks so much! Can you make this recipe as cupcakes? How long would it bake? such a pretty & amazing little cake!! love! Do you have any suggestions for making this cake less dense? More baking soda? This recipe is simply delicious!! It turned out so well for me and guess what?? It’s my first ever cake 😍😍😍 I am so stoked!!! Thanks a ton Christina !! Loved this! I made it tonight and it was phenomenal. The buttercream was delicious too. I usually don’t like buttercream because it tastes too much like powdered sugar but not with this recipe. I also needed to make it for only 4 people and it was the absolute perfect amount. Thanks for a great dessert! But, I added coconut to the butter cream! It’s the perfect size! But my cake turned out to be a little too buttery even though I put only 6 tablespoons. It was really good nevertheless but too buttery. Anything suggestion that might help next time? Made in oven…wonderful. If I wanted to make this in an Instant Pot (I checked and you didnt have any IP cake recipes), what pressure Cook settings would you recommend. This is a great recipe! I made it for my 25th birthday! I just have one question, how do you prevent a domed top on the cake? So glad you liked it! It sounds like your oven might have a hot spot. Mine has a slight dome, but it’s easy to slice off before frosting if it bothers you. Hi question the tablespoon of vanilla seemed a bit excessive. Is that correct a tablespoon? I just put in a tsp because I wasn’t sure. It’s in the oven now so we will see later I guess. I made them as 4 large cupcakes and I added sprinkles for a confetti cake look. Excited to taste it. I made the mini chocolate cake a few weeks ago and that was a hit. Yep, one full tablespoon is correct. do we need to add the apple cider vinegar? Can we make the recipe without it? It’s the acid that reacts with the leavener to make the cake rise. Don’t leave it out, sorry!